This coachbuilt 1969 Cadillac station wagon has everything a well-heeled suburban dad of the previous century could want: plush appointments, old-world 472ci V8 and rear-facing seats—located about a mile back—to keep the rugrats out of earshot. 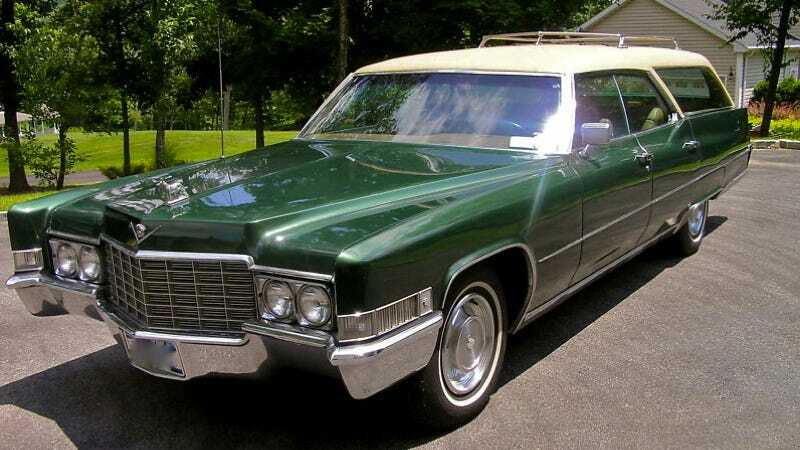 The seller didn't post the usual collector-grade scads of info on the rare family Caddy, so we turned to Cadillacstationwagon.com (yes, because Cadillac Station Wagon) for some deep background. While the provenance needs verification, this could be one of five custom Cadillac wagons used to transport VIPs at the Indianapolis 500. Reportedly, all five of the custom-built Indianapolis 500 cars were eventually sold by a Cadillac dealer in Dallas. Apparently it cost as much as a fully-loaded Corvette Stingray of the time ($6,500) just for the conversion. At least now we know that two more of the wagons were built in 1972, one for Elvis, the other for Dean Martin. Naturally.